Prance to the Music 1E | First Edition 1E Ponies Figurines | One Price Low Flat Shipping! 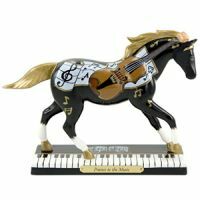 This is a very rare first edition Prance to the Music painted pony model. These highly collectible versions are from the first production run manufactured, which is indicated on the bottom of the pony's base with the "1E" prefix before the hand-written serial number. Great addition for the elite Trail of the Painted Ponies collector! 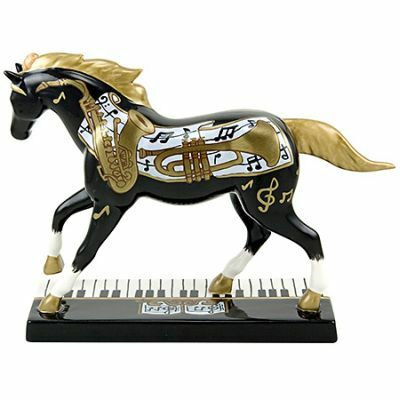 Decorated with orchestral instruments played in a symphony, this musical pony is high-stepping across a piano keyboard. Prance to the Music is a design that takes us on a ride across a new and original harmonic landscape! Trail of Painted Ponies Retired Australian Exclusive First Edition 1E Reflections of Australia 6.5"